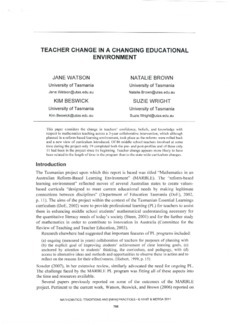 This paper considers the change in teachers’ confidence, beliefs, and knowledge with respect to mathematics teaching across a 3-year collaborative intervention, which although planned in a reform-based learning environment, took place as the reforms were rolled back and a new view of curriculum introduced. Of 86 middle school teachers involved at some time during the project only 19 completed both the pre- and post-profiles and of these only 11 had been in the project since its beginning. Teacher change appears more likely to have been related to the length of the time in the program than to the state-wide curriculum changes.